The Communist Party USA has been working hard to muster the crucial Latino vote for Barack Obama for many months. Now Obama's other key Marxist ally, Democratic Socialists of America (DSA) is trying to manipulate the must win Latino vote through their Chairmanship of Latinos for Obama. According to the Communist Party USA's Peoples Weekly World. Who is Jose LaLuz? Why has he left his Puerto Rican base to campaign across the Southwest for Barack Obama? In the early 1970s Jose LaLuz was active in the Connecticutt branch of the Puerto Rican Socialist Party (PSP). Allied to Castro's Cuba, the Marxist-Leninist PSP agitated for Puerto Rican independence and committed several bombings and other terrorist acts on US soil. LaLuz was expelled from the PSP in 1976 and went on to to join the Democratic Socialist Organizing Committee (DSOC)the following year. He became Chairman of the Hispanic Commission of DSOC, before the merger with the New American Movement that created DSA in 1983. Like many in the DSOC/DSA LaLuz also supported the CPUSA initiated and dominated US Peace Council-an affiliate of the Soviet front World Peace Council. LaLuz rose through labour movement ranks and today serves as Executive Director of Servidores Publicos Unidos de Puerto Rico/AFSCME (United Public Employees of Puerto Rico). Jose LaLuz is also Vice Chair of the several thousand strong DSA, making him one of the most influential socialists in America. Like many DSA linked unionists backing Obama,La Luz has ties to the Chicago socialists who have supported Barack Obama since his earliest days in the "Windy City". 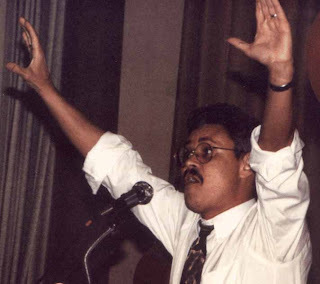 The photo at right pictures La Luz addressing a DSA sponsored 1992 dinner in Chicago. The 34th Annual Dinner was held on May 1, 1992 at the Congress Hotel in Chicago. The Master of Ceremonies was Michael Lighty, who was then the Executive Director of DSA. Sue Purrington, the Executive Director of Chicago NOW, and Dr. Quentin Young, President of Physicians for a National Health Program, were the honorees. The featured speaker was Jose La Luz, who was the National Education Director of the Amalgamated Clothing and Textile Workers Union. DSA member Quentin Young incidentally, is a long time neighbour, friend and supporter of Barack Obama. Young attended the famed 1995 gathering in Chicago with US Peace Council activist Alice Palmer, in the home of former Weather Underground terrorists Bill Ayres and Bernardine Dohrn. Bernadine Dohrn was one of the first radicals to travel to Castro's Cuba with one of the early Venceremos Brigades. Some of Quentin Young's children are also Brigade veterans. Jose LaLuz might struggle to win the patriotic Cuban American vote for Obama, if they knew how many Castroites had helped launch the good Senator's career.